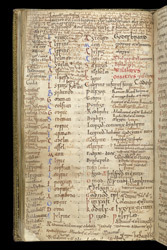 The Liber Vitae ('Book of Life') of New Minster and Hyde Abbey contains a list of names of the members of the community and its associates and benefactors, living and dead, along with two unusual pictures, grants, historical accounts, material for church services, prayers and other devotional material. It is thought that Aelfwine, abbot 1031-1057, had the book made at the beginning of his abbacy and to commemorate the New Minster's associations with royal patrons. The name of the scribe, Aelfsige, a monk and priest who also wrote Aelfwine's prayerbook (British Library), appears on one of its pages. This manuscript is called the Liber Vitae because it was meant as a contribution to the Eternal Book of Life in which the names of the saved were believed to have been written. Every day, at one of the major church services held at Hyde Abbey, names were read aloud from the list at the high altar. In 1110 the New Minster moved from Winchester to Hyde. This chaotic-looking page comes from the lengthy list of lay-brethren (both men and women). At first, the names are arranged in columns and numbered (i to xviii) but afterwards are not numbered and the handwriting changes through all the periods of the abbey down to the time of its suppression in the 16th century. One wonders if delivery suffered during reading aloud from it, but also it shows how important the list in the Liber Vitae was to the brethren.